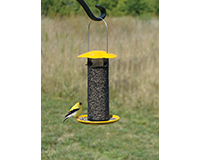 The Petite Yellow Thistle Feeder is ready to hang, extremely easy to use, fill and clean. Niger seed (thistle) is one of the favorite seeds of goldfinches, Pine Siskins, Common Redpolls and other small-billed seed-eating birds. You may also see nuthatches, chickadees, doves, Downy Woodpeckers, and other small birds eating it, Drainage holes in seed tray keep seed dry. Weather durable powder coated finish mesh. Holds approximately .5 lbs of thistle seed. Measures approx. 5" x12".